In our Montessori teaching album for infants and toddlers, we discuss the use and presentation of a lot of material that is designed to promote the brain-body development link. This object permanence box for infants is a wonderful piece of equipment that can also be made at home. For example, you can take a small box (about half the size of a shoe box) and cut a round hole exactly the size of the ball on the top of the box. 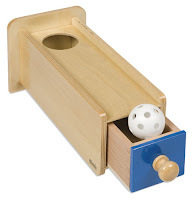 Using the ball shown, your child can experiment by putting the ball through the top round hole and then lifting the lid to find that the ball is inside the box. Promoting this sorts of physical and intellectual interaction addresses your child's development needs in these early years. For those of you who have purchased this teaching album, it is important to get or make as much of this series of material as possible -- it is all in the same chapter in the album. The Montessori curriculum for children between infancy and two years of age has been an active topic of discussion. The main focus of the curriculum is to help your young child develop in the areas in which he or she should naturally be focusing such as language, body and brain coordination and development, and interaction with others. Some of the simplest material that we introduce for infants and toddlers is the most important. For example, there is a whole section of lessons in the album that addresses brain and body development directly: the object permanence box use that covers the stage of development in which children discover that an object continues to be the same, even when you cannot see it (e.g. Mommy still exists even if she has gone to work this morning); imbucare boxes designed for infants to work on hand-eye coordination as he or she works with cylinders, cubes, triangle prisms, and rectangular prisms (are you using the language of the pieces to introduce the vocabulary to your child? ); supinated wrist movement exercises that help children work with hand and wrist movements that will be the foundation for writing, fine motor skills, and other key movements later, and; simple shape puzzles, bells, and mirrors. We discourage you from attempting to push reading and other topics that might be considered more academic at this time. The building blocks for development are crucial, and your child is not helped by learning to memorize words on cards or other material that is outside of his or her developmental needs now. The prices of material such as the imbucare boxes or the object permanence boxes can be a bit daunting, but you can usually find good deals online and the price of these pieces of material are inline with those of regular toys, so we encourage you to make the substitution when you buy gifts and toys for your child. A lot of our readers have had success putting this material on gift lists for holidays and other special occasions as well. For children in the two and up age group, we recommend daytime read aloud sessions of 15-30 minutes using a non-fiction source. We found some great (free) material online about water and the Chesapeake Bay that we wanted to share with everyone who is homeschooling or informally working with their children at home. This daytime reading is not meant to take the place of time-honored bedtime stories! All of the small pieces of equipment such as the ball and geometric shapes in the Infant Object Permanence Boxes are meant to be held in a three-fingered grasp (e.g. pointer, index, and thumb). This grasp is a natural one for infants and toddlers, but worth mentioning because adults tend to pick things up with two fingers (e.g. pointer and thumb) and you should use the grasp that you want your child to use. Younger children will tend to use their whole hands when holding something large. This is fine. No need to correct anything, but just make sure you use the three-fingered grasp with equipment for which your child will need to use it. Check out our Montessori Curriculum Teaching Albums! 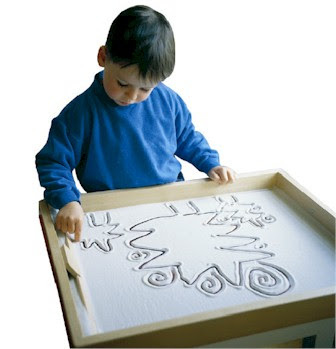 This Sand Tray is your child's first introduction to writing and writing-related motor skills. Let your child enjoy tracing and drawing shapes in the sand and then show him or her how to make curves, circles, lines, and dots. Once your child has been introduced a handful of letters via the Sandpaper Letters, you can show your child how to trace these letters in the Sand Tray, too. However, if your child prefers to draw in the sand, that's fine! Montessori Teaching Curriculum: Where to Sit? When we write, "Sit on your child’s non-dominant side," this means that you should sit on the left side of a right-handed child. And, naturally, on the right side of a left-handed child. Try having a friend sit on your right side while you try to use a pen with your right hand. Does it feel as if they are in your way? You can’t quite move the way you would like to or you have to be careful that you do not bump into them? Are you not sure which side your child favors or do sides alternate? Try different sides and see what happens. Be aware of your child's body language and interaction with you when you are on the right side versus the left side. The goal is to have your physical presence not interfere with the presentation or work at hand. Your role is to guide and present without changing your child's focus. In our curriculum guides, we discuss using mats or carpets for floor-based projects that are frequently presented in the Montessori classroom. Note that these carpets should be of a simple single color. Lines and patterns distract from a lot of the projects and equipment -- for example, setting up geometric shapes or different types of triangles involves looking at the lines of the equipment itself, so a patterned carpet does not work well. Look for a carpet that is the size of a yoga mat, but made from a flat carpet. Avoid materials that bunch, wrinkle, or gather. 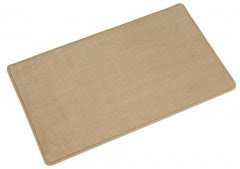 This beige floor mat is featured on the Nienhuis site. For those of you who subscribed to the curriculum newsletters or purchased our Montessori teaching binder, we will be posting additional notes here on our blog, so do check back from time to time or subscribe to our handy Montessori at Home rss feed! In our curriculum for infants and toddlers, we discuss the presentation format, materials needed, and sequence of events for each lesson or exercise. You will notice, however, that there is no particular length of time for the duration of each lesson. This is key because the length of time that an individual child will be focused on a particular exercise depends on that child. Once you set up the exercise with all of the equipment and present it, the number of times your child decides to, for example, pour water from one pitcher to another, is an independent choice. At the right stage in a child's development, he or she will has the ability to be completely captivated by a certain type of lesson, for example, a fine motor skills and hand-eye coordination practice lesson such as the Practical Life Water Pouring Exercise. This means that your child's current stage of development calls for this type of skill practice and development in terms of the Montessori Sensitive Periods of Development. Importantly, make sure that you allow your child to engage his or her periods of attention during these projects without adding interruptions. It is really tempting to go up and talk to a child who is being super cute by doing the same thing over and over, but this is the time that you need to step back and let your child develop the particular skill that has caught his or her attention! For step-by-step lessons, check out our Montessori teaching curriculum for parents and teachers. 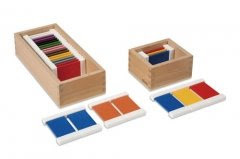 A quick recommendation to the new teacher who contacted us for advice on what material to buy for her new classroom: Nienhuis, the traditional Montessori equipment maker, now has a site with material and price information online. Other suppliers are good and cheaper, but we have not kept track of the varying quality versus price tradeoff with the others, so Nienhuis is our fallback. 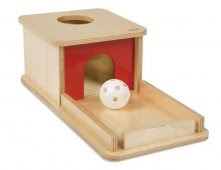 Here is the link for Nienhuis Montessori equipment. Infant and Toddler Imbucare boxes: You can select one or two to start out. You will find the prices are a good incentive to look at DIY. Toddler Simple Puzzles: The two sets shown -- Single Shape and Multiple Shapes Puzzles -- are great because the introduce shapes and varying sizes of the same shape. Knobs that are easy to handle are key because you are building refined hand movements and fine motor skills. Toddler Infilare Exercises: The Three Discs on a Vertical Dowel are surprisingly affordable. Again, you can pick three different sets out of the equipment line up here and be fine. Toddler Supinated Wrist Movement: Worth buying a few because these are hard to make, unless you are unusually gifted with DIY. The Interlocking Discs are super popular with kids. Infant and Toddler Dressing Frames: These are perfect for Montessori DIY! The Threading and Braiding Material is definitely a good Montessori DIY project. The Infant Mirror has a handle, which is fabulous, so check out the pic before making your own. Infant Bell: Very cool. Good price, too. Geography Material: The sandpaper globes and simple maps are really great to have at home. Globes make enjoyable and educational bedroom decor for children of all ages! Practical Life: Sorting tray. I really like this one! See the pic above. You can make your own! This is the first post in what will be a short series addressing infant and toddler development within the Montessori setting. 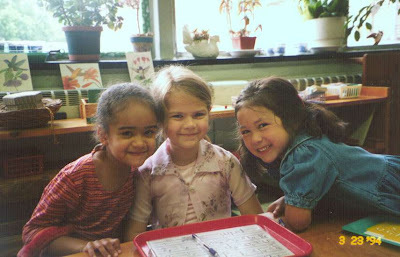 Montessori teaching methodology for all ages focuses on providing the right learning environment with the appropriate material, teacher, and student mix that will allow children to follow their own individual paths to learning. For infants and toddlers, this focus on the individual path is especially important because children in this age group are developing so many key facets of themselves during these early years. A lot of parents ask us for a very clear and precise curriculum with information on how much time should be dedicated to teaching a certain lesson and when their child should move to the next more difficult topic. No matter what curriculum one follows, this is pretty much impossible due to the different developmental schedules of young children. In our teaching binders, we strive to provide the same mix of topics and developmental exercises that one would find in a real life classroom, so parents can set up the material and let their children learn at an individualized pace. Some children may spend hours on a project that other children spend months enjoying. This is completely natural and does not indicate any developmental level or differing progress achievements. See our Montessori teaching curriculum for infants and toddlers. Some of our readers are volunteering with new mothers and asked for health information, so we have been looking... Here is a great article by the National Institute of Health that comes complete with free multilingual printable information. I also thought it a useful reminder that soft plushy surfaces can pose Sudden Infant Death (SID) risks to infants because a lot of new organic mattresses and padding is not as firm as regular bedding. Also, given my experience with wonderful sinkable organic rubber tree derived latex mattresses at home, remember that if you sleep with your infant in your bed, the surface of your own bed will be important. To read the entire article on Safe Sleep for Your Baby: Ten Ways to Reduce the Risk of Sudden Infant Death (SID) visit the NIH site. Those of you volunteering in the community will find the free printable material links there. The First Box of Color Tablets is the official name for the box on the right that includes three pairs of red, yellow, and blue tablets. Superb for introducing toddlers to color names, these beautiful tablets are meant to be handled by the tabs on the top and bottom (the white bars). You can show your child how to hold them by simply grasping them with either one hand or two hands, depending on how big your child's hands are because he or she will copy what you do. For DIY tablets, you can make colored bars with handles out of any material that allows the colors to come through well. If you are buying red, yellow, and blue child-safe paint, remember to get a lot because these colors are used frequently in the classroom for other material you will want later. More Montessori House curriculum ideas for infants and toddlers. "Crossing the midline" is a concept in a lot of toddler equipment that you can see clearly from the equipment itself. Look for the midpoint in the dowel and see how the relationship between the objects on the dowel and the arrangement interact. 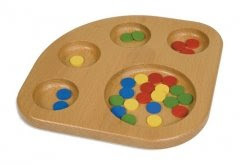 Your child will experiment with this relationship as he or she arranges all of the discs on this particular dowel. Since this is a horizontal dowel, your child will need to carefully push the discs past the midline to fit all of them onto the dowel, unlike the vertical dowel where the cubes go to the base by themselves. 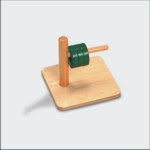 One key feature of Montessori equipment is that it is well-crafted. Everything balances, stands, and performs its function flawlessly. If you find yourself looking at material that is not steady or does not fit well together (e.g. the lid does not close completely or the dowels are different sizes), don't buy it! The easiest way to create a good DIY project out of this concept is to attach a vertical dowel to a stand and find a series of large symetrical round or square beads of the same color to use as disks. Of course, if you are good with woodworking, a horizontal and vertical dowel set would be great. More curriculum and lessons for little ones in our Montessori curriculum monthly newsletters (only $12.99 a year). Photo credit: Nienhuis Montessori equipment for infants and toddlers. This Velcro frame is the easiest frame to use and make. Use the same set up, shelf, and steps as shown above for the button frame. When you close the flaps, close the one on the bottom first. Then place the top flap on top of the bottom flap. Press lightly. Show your child how it sticks together. Let your child work with this and other exercises for as long as he or she wishes. The dressing frame sets include a number of different types such as buttons, laces, and zippers, but you can also make this into an easy (and cheap) DIY project. If you are making dressing frames for your older infant or toddler, the dressing frame with three large buttons comes next. More curriculum ideas in our Montessori curriculum monthly newsletters. Infants and toddlers explore and discover the world around them using all their senses, but the sense of touch is much more important than one might think. In the Montessori classroom, we create Mystery Bags full of objects that can be identified by touch. Taking this concept and adapting it for infants and toddlers allows us to help our children satisfy their need to touch (and taste) everything around them. Put together three simple and distinctly different objects such as an apple, a baby-safe soft toy, and a block. Find a cloth or brown paper bag and place the objects inside. Now let your toddler sit on the floor and explore the objects in the bag. You can add or change the contents as needed. If your child is still an infant, you do not need to use the bag now. Just sit with your child and let him or her explore the object. 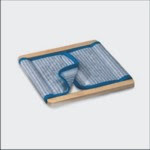 You can also let your child sit or lie on a mat on the floor and independently handle the object. We just started a Mandarin Chinese focused blog for parents of young children. Check out our Montessori for Mandarin Chinese! When your infant or toddler is eating or playing, you can take the opportunity to introduce counting and quantities in a fun way that integrates math and language with overall fun. For example, you can put three berries into your child's oatmeal. As you help your child with the spoon and oatmeal, you can count the berries as they go onto the spoon...one, two, three! If you and your child are sitting on the floor, you can roll three soft balls his or her way as you count them, too. You can also add in the name of the item -- one ball, two balls, three balls. Just look for opportunities to mix touch, sight, and the use of language to the exercise and remember NOT to take the counting part seriously at all right now. This should all be relaxed and enjoyable parent-child time with no thought of actually having your infant or young toddler really remember the counting. Large-sized nuts and bolts are one of the most popular toddler exercises in the Montessori program for toddlers! Put the bolts on the nuts, place the sets in the larger bowl, and put all the bowls on the tray. Keep the tray in the Practical Life section of your home classroom so your child can return to use it whenever he or she likes. 1. What to do: Invite your child to try this exercise. 2. Take the tray from the shelf and place it on the table. 3. Sit on your child's non-dominant side (on the left of a right-handed child). 4. Pick up one nut and bolt. Hold the bolt with your left hand and unscrew the nut with your right hand (if you think your child is left-handed, switch hands). 5. Put the nut in one bowl and the bolt in the other. 6. Ask your child if he or she would like to try. 7. Let your child tinker with the process and work alone (sometimes it is easiest if you excuse yourself and wander off a bit). 8. Your child can put everything back together and put the tray on the shelf. Younger toddlers and infants who are still putting things in their mouths can work well with wooden or plastic (depending on your feelings about plastic) versions of nuts and bolts, too. Learn more about teaching your child at home with Montessori with our curriculum newsletters. All exercises in the Montessori class are designed to incorporate an element of language. Whether your child is working with sweeping, counting beads, or using the musical bells, your use of language is important. Focus on succinct phrasing along with rich and precise vocabulary. For example, use the word "thin" to describe something that is thin, rather than using the word "small" as you might be tempted to do because you know your child knows the meaning of the word. Learn more about using Montessori with infants and toddlers by signing up for our Montessori at home curriculum newsletters. Montessori for Infants and Toddlers! We had originally moved this blog to one on our site here, but since we had a lot of readers coming to this initial blog, we decided to devote this one to infants and toddlers. If your child is over the age of three or you are looking for general Montessori and early childhood information, please do take a peek at our Montessori House at Home blog. Are you new to Montessori? Maria Montessori's original book, the Montessori Method, is available for free online at The Celebration of Women Writers site.